LED efficiency and swivel and extension cord flexibility make for handy flood light. Gotta' work on trailer lights? Of course it's night, and more than likely very hot or very cold -- and you can't see a 36-inch pipe wrench if you were holding it! You need a portable flood light designed to take a beating and still provide illumination. For a long-lasting, energy efficient flood light, the Shur-Co LED LiteAll fills the bill with flexibility and performance. The LiteALL's work lights are set into hinged brackets that allow them to swivel forward and back, and those units are equipped with a 20-foot extension cable. The LiteAll is integrated into Shur-Co's wireless remote system which sports a five-channel transmitter. Shur-Co's new LED LiteALL comes ready to work with the company's wireless remote, and features swivels and a 20-foot extension cable. 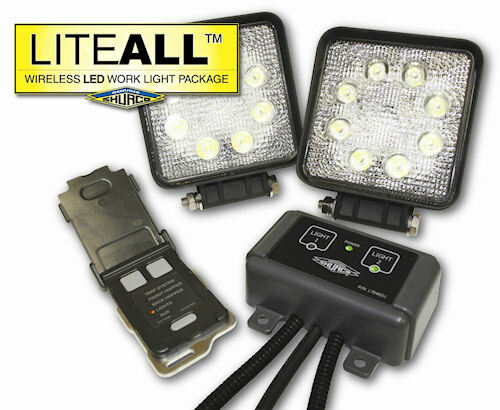 The LiteALL kit includes construction of diecast aluminum; an IP67 waterproof rating, 1600-lumen output, 12-volt power requirement and a 24 watt output with a 1.8-amp current draw. The LEDs used are estimated to last for 30,000 operating hours. The LiteAll is to be available through a nationwide network of Shur-Co dealers, as well as through one of Shur-Co's eight service centers and on-line at SopShurCo.com. For more information, call (800) 474-8756 or visit www.shurco.com.